Investment totalling a trillion euros (£846bn) is required before the end of this decade if the European Union is to stave off an energy crisis. That is the conclusion of an eight-month inquiry by the House of Lords into the EU power sector. The Lords report says that a muddled Brussels energy policy is putting off big investors. 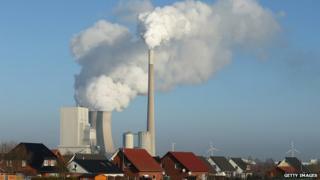 In addition, it says there needs to be greater support for Europe's Emissions Trading System (ETS). The Lords EU sub-committee on agriculture, fisheries, environment and energy took evidence from a range of parties including the European Commission, power companies and environmental campaigners. Their report says that there is an urgent need for investment in low carbon, interconnected and innovative energy systems. The committee agreed with the European Commission estimate that to achieve secure, green and cheap energy by 2020, a trillion euros will need to be spent on infrastructure. The money is there from institutional investors for these energy projects, say the Lords. But the lack of a clear policy about how to deliver secure and affordable power is holding them back. "The value of energy companies has slumped since 2008, the public purse is severely constrained, but there is more than enough money around in the investment community," said Lord Carter of Coles, who chaired the committee. "This should be a great time to invest in long-term assets such as energy, but clear policy is needed in order to release it," he said. The Lords point to two core policies that they say need to be in place. The ETS needs urgent revision, they say. In recent weeks, the price of carbon has crashed further after the European Parliament baulked at a commission proposal to overhaul the market. "The ETS has failed but it is not dead," said Lord Carter. "It needs to include a minimum price for carbon, providing governments and investors with the confidence to support innovation through investment." That minimum price is required to prevent countries reverting to coal, which has become much cheaper on global markets as a result of the shale oil and gas boom in the US. The other critical policy that needs to be in place is one the UK has refused to endorse. According to the Lords, a target for the proportion of renewables in the energy mix up to 2030 is rapidly required. The committee also calls for the development of electricity inter-connections between member states, along the lines of the agreement reached between the UK and the Irish Republic over wind power in January. "The inter-connection issue really needs to be developed quickly. We saw a case in the Pyrenees where the inter-connecter between Spain and France took 30 years because environmentalists couldn't agree," Lord Carter added. The Lords are also calling for the development of a regulatory structure for the exploitation of shale gas in the EU.